In 1977, Xerox made what remains one of TV’s most popular ads, more than 30 years before social networks revolutionized media consumption. The spot aired during Super Bowl XI and starred a monk named Dominic who discovered a not-quite-miraculous way to produce 500 copies of a painstakingly handwritten manuscript. Nearly four decades later, Xerox vp of global advertising Barbara Basney still regularly receives requests to air the above spot as the Big Game approaches. “Everyone wants to do a ‘best Super Bowl commercials of all time,’ and they call us asking for permission,” she said. Yet Xerox has changed dramatically since Brother Dominic first graced American screens. This week, the corporation officially split into two companies by spinning off business services division Conduent. With a new campaign, Xerox now wants to further distinguish itself by paying homage to the ad that made its name synonymous with the copying machine. Creative agency of record Y&R New York set Dominic’s tale in the present day to illustrate Xerox’s new tagline/brand platform “Set the Page Free” by telling the story of a company long defined by ink and paper adapting to an increasingly paperless world. As the spot makes clear, Xerox has moved far beyond the classic, bulky 914 copier that caused such a stir at Sterling Cooper in 1962 and into a network of digital documents translated into 35 languages with one click in an app. “Through the lens of the original ‘Brother Dominic’ spot, we are looking to show what Xerox is today,” said Basney. Y&R similarly saw an opportunity to show, rather than tell, viewers about the company’s range of contemporary products. Many of the business decision makers in this campaign’s target audience are old enough to remember the first spot. But both Basney and Sims said the new ad proved surprisingly effective when tested in seven countries, even among younger viewers who appreciated the juxtaposition of a decidedly old-world lifestyle with modern devices that transcend the most basic human divides like those of, say, religion. Initially, Y&R only joked about remaking the 1977 classic. But it wasn’t long before both client and agency sought out Allen Kay, the former Needham creative director who developed both the Dominic campaign and the New York MTA’s post 9/11 “If you see something, say something” tagline. According to Sims, Kay shared tales of his time in the ad industry trenches and the Super Bowl spot’s unexpected popularity as the agency updated his best-known work. 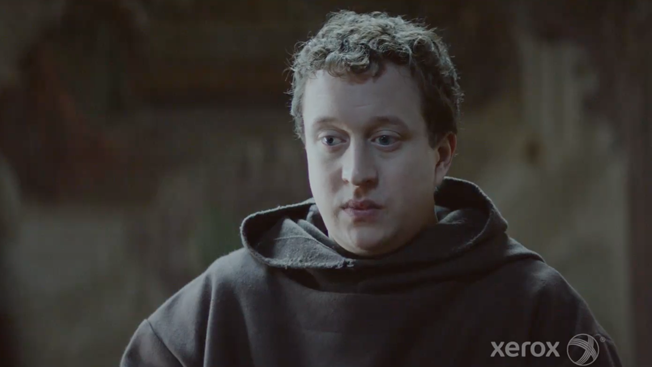 Unlike its predecessor, the new “Brother Dominic” is not a Super Bowl ad. Xerox will air 60 and 30-second versions of the spot on TV in the U.S. while making paid digital and social media placements internationally. It will also work its new “Set the Page Free” platform into company marketing, communications and events throughout the year.